"We will always be sure to refer you to all our friends and family!" Thank you so much for all that you have done to help make our 20th Anniversary so special! 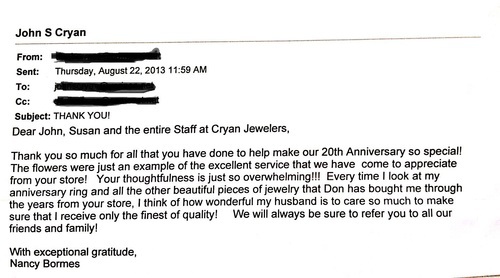 The flowers were just an example of the excellent service that we have come to appreciate from your store! Your thoughtfulness is just so overwhelming!!! Every time I look at my anniversary ring and all the other beautiful pieces of jewelry that Don has bought me through the years from your store, I think of how wonderful my husband is to care so much to make sure that I receive only the finest of quality! We will always be sure to refer you to all our friends and family!